The headline on the KHOU website was alarming: “Health department says filthy taco truck vendors found during surprise visits.” It was also surprising, at least to me. I’m a taco truck connoisseur. The food can be phenomenal — some of the best in the city — and the price is right. But I’m also a stickler for hygiene and cleanliness. Lord knows the sickest I’ve ever been is from food poisoning. So it’s ironic that I’ve never gotten sick from eating at a taco truck. In fact, I’ve made it a habit to keep a close eye on the conditions of the taco trucks I patronize, and the vast majority are clean and well-run. In my experience the workers are hygienic and well-groomed (not to mention hardworking). I can assure you, if I come across a food establishment that is obviously unsanitary, I’ll stop going there and report it to anyone who will listen. Hundreds of people die each year from food poisoning. So how could I explain the discrepancy between the apparently dire conditions found by the KHOU reporter and my own benign and even enjoyable experiences eating at taco trucks? Local television news organizations are, after all, one of the most reliable and trustworthy sources of news in any community. I have no idea if the reporter, Jeff McShan, knew of the hornet’s nest he was getting into when it comes to taco truck politics with its undercurrents of racism, xenophobia, and anti-competitiveness. But based on my own research and experience, I believe that KHOU’s taco truck piece is just another example of the disingenuous, alarmist, and fearmongering “journalism” that is the hallmark of local TV news. Let’s go to the video, shall we? After the anchors set up the spot, the video begins with a fly — one single fly — buzzing around the interior of a taco truck. We see a clean and well-kempt young Hispanic man with hair cut so short he is basically bald, as an ominous voice-over bemoans the lack of hairnets. Yes, I know even short-haired workers must wear hairnets, but couldn’t they find a better example? Next we see a city health inspector who talks like Flo the Waitress addressing confused workers as “Precious” and berating them about “bad hand contact!” She also lectures them on storing what appears to be a bottle of cleaning liquid too close to a food preparation area. No, I don’t want hazardous chemicals next to my food, but again, couldn’t they find something more incriminating than improperly stored cleaning materials in a supposedly filthy food establishment? So what happened? Where’s the (rancid) beef? I’m quite sure if they had found a dog carcass or some gopher meat or something, the images would have been played on an endless teaser loop in the hours leading up to the late local news. What accounts for the seeming lack of any “smoking gun?” Because I doubt there was one. Here’s why. One of the great resources provided by the City of Houston is the Health Department’s Food Inspection website. Here you can look up the records for every restaurant inspection. I wanted to determine if the inspections of the taco trucks reported by KHOU were truly representative of “filthy” or unhealthful conditions as they relate to other routine health inspections. To do this, I compared the historical inspections between one of the taco trucks in the report, “Taqueria Veracruz,” with one of Houston’s most professionally-run and well-respected restaurants — Tony’s. The results are interesting. From May 2007 to May 2010, “Tony’s Restaurant” kitchen was inspected five times and the “Taqueria Veracruz – Mi Jalisco” truck 10 times. All inspections for both were listed as “Routine Inspections,” none were listed as due to a “Complaint.” Over the course of these inspections, Tony’s averaged 4.4 violations per inspection, while Veracruz averaged 2.5 violations per inspection. Sure, they are different-sized operations, but you would still expect these “filthy” taco trucks to rack up more violations than the fanciest restaurant in Houston. Furthermore, health violations are categorized into three grades from most-to-least impactful on public health: substantial (most impactful), serious, and general (least impactful). Neither establishment had any substantial violations. Both establishments had about an equal number of serious and general violations in their respective number of total violations. What can we conclude from a review of these records? Most health inspection reports are reflections of exactly what they are: routine inspections where otherwise sanitary kitchens are reminded about actions they need to take to stay clean and compliant with legitimate health codes. Just because violations are found at Tony’s during a routine inspection does not mean it is a “filthy” or unsanitary restaurant. It’s not. But neither is the Taqueria Veracruz taco truck. I can only imagine that for every wacko that actually took the time to comment on the website, there must be hundreds if not thousands sitting at home watching this report, thinking the same thing. I want to make a few things clear. I am not advocating that the Health Department use kid gloves when inspecting taco trucks. On the contrary, I expect the Health Department to aggressively inspect taco trucks, and all food establishments, to ensure public safety. But I do object to any sensational or alarmist characterizations, either by the Health Department or a local TV crew riding along, that misrepresent the results of those inspections. 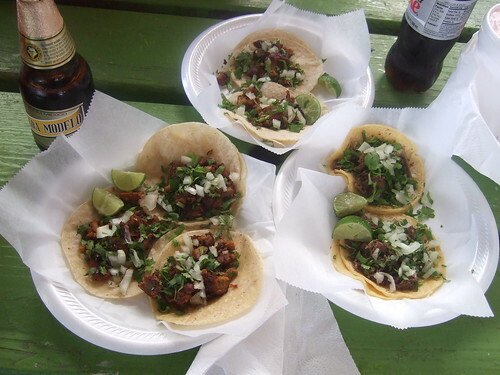 Based on my own experiences with taco trucks, as well as on the knowledge gained from researching this blog post, I’ll continue patronizing establishments like Taqueria Veracruz (and Tony’s). What I can do, and will do, is choose not to watch local TV news. This blog entry was originally posted 1 June 2010 on the www.29-95.com website. This entry was posted in 29-95, Favorites, Food, Food for Thought, Food Policy, Houston Chronicle and tagged food truck, health code, health department, khou, taco truck, tacos, tony's. Bookmark the permalink. I've always noticed that any news story covering something I really know about is, if not factually inaccurate, completely misses the point. I'm totally with you on this one. THANK YOU! Not only do I love taco truck but I COMPLETELY agree with the sensationalism of reporting the outrageous. Great article!